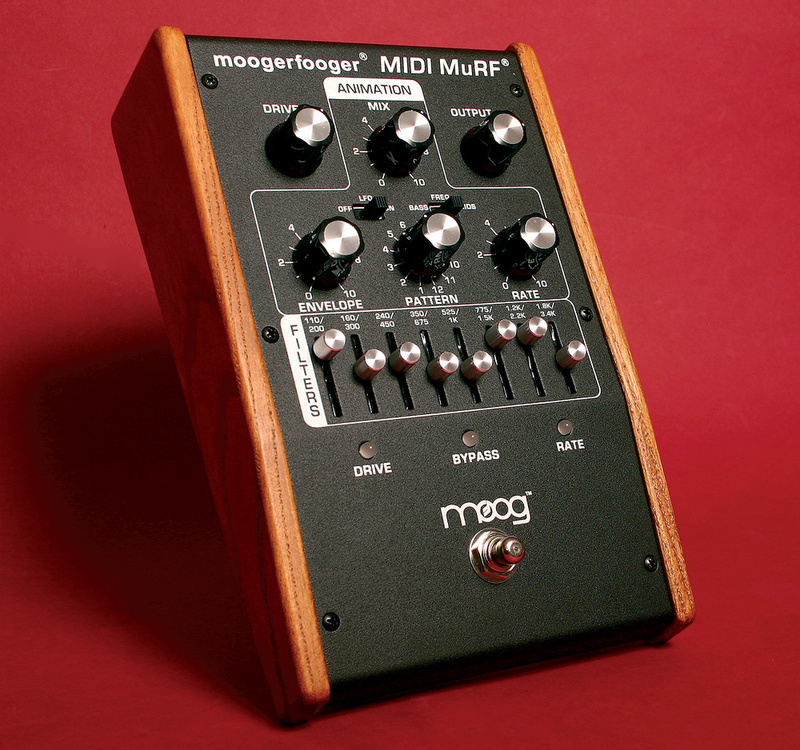 The latest Moogerfooger pedal combines the two previous MuRFs and adds MIDI. For 10 years, Bob Moog's Moogerfoogers have graced these pages. Offering modular synth processing in compact format, they are refreshingly direct and thoroughly analogue. That's about to change slightly with the appearance of a hybrid Moogerfooger, one that retains all the qualities we know but adds the precision and controllability of a digital interface. The MF105M Multiple Resonant Filter — or MIDI MuRF — is the direct descendant of the MF105 I reviewed some four years ago. Then, Moog's box of band‑pass filters added warmth, colour and animation to bright, rich if generally mid‑range signals. Those who felt the lower end of the spectrum deserved a look in were rewarded with a follow‑up, the MF105B. In this Bass MuRF, one of the band‑pass filters was replaced with a low‑pass (tuned at 110Hz); the rest were shifted down to occupy a range between 160 and 1800Hz. There the story might have ended — except that somebody had a bright idea. Why not combine the two MuRFs in a single unit? With another hardware incarnation on the cards, Moog decided to go to town and implement everything. Perhaps reviews and user input made some contribution, because it's hard to imagine much that has been omitted. The MF105M features both 'Bass' and 'Mids' tunings, user‑programmable filter patterns, MIDI control of every knob, switch and slider, plus additional functionality for which no hardware control even exists. All this comes in at only a fraction over the cost of a standard MuRF. Some days it's easy to believe the geeks really will inherit the earth! The rear panel features voltage inputs for Rate, Mix Envelope and LFO/Sweep, as well as audio in, stereo audio outputs and the all-important MIDI input. I described the MuRF's bounties in the previous review (SOS April 2005) so will offer only a brief recap here. A wood‑framed pedal with classy‑feeling controls and lots of voltage inputs, the MuRF integrates well with modular setups but is equally at home amongst guitar pedals, or on the desktop. The eight analogue filters have cutoff frequencies and resonance values fixed at the factory. Only their levels and the shape of the triggered envelopes are tweakable. Envelope shape is set by a single control that smoothly morphs through short, fast‑attack blips to reversed, almost phaser‑like shifts. The key to the MuRF effect is therefore the cyclic triggering of each filter envelope in a selection of patterns, some of which include LFO motion. This is known as animation. You'll be glad to hear that none of that functionality has been sacrificed in the creation of the MIDI MuRF. As before, a Drive control is used to set an input level suitable for a wide range of sources. A series of sliders sets the level of each filter. 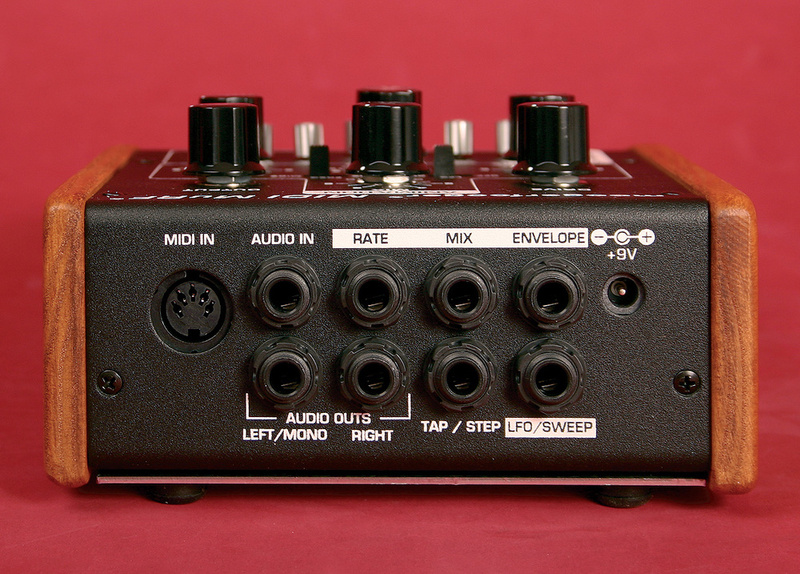 Other than a MIDI input socket, there are few visible clues to anything particularly new, though an extra switch has appeared to engage or disengage the internal LFO. This LFO is now accessible to every pattern and adds a subtle sweep to the filters' cutoff frequencies. It is particularly effective when both the left and right outputs are used (when the odd‑numbered filters are sent to one output and the even‑numbered to the other). The inclusion of the MF105B's bass‑oriented filters has resulted in a change to the way patterns are selected. The bank selection switch is replaced by one that now selects either Bass or Mids operation. When set to Bass, there are 12 animation patterns to choose from, while Mids offers a different 12. Within either selection, the first pattern cannot be overwritten; it simply operates as a fixed filter bank without animation. The remaining 11 patterns are of the cascading or rhythmic types we enjoyed previously. The Bass MuRF has a markedly different tonality to the original pedal. Whether processing the subbiest of subs or the grungiest of power chords, everything is rendered with due deference to the fuller figure. Indeed, you might become so enamoured of bass that you prefer to use it exclusively. If so, you might feel a mere 12 patterns aren't enough when compared to the dedicated pedal. Fortunately a solution is available, although to find it you'll need to read the manual — something usually optional for Moogerfoogers. The MIDI MuRF's Pattern editor software gives in‑depth control over each filter's envelope and will work by itself or under a VST‑compatible host. Fortunately, the manual is well written and presents a full explanation of the minutiae of MuRFing. Its only offence is the use of 'reoccurring', a sin more than absolved by the gift of oodles of clear MIDI information. Every Continuous Controller (CC) associated with a knob, switch or slider is revealed, along with functionality only accessible via MIDI. 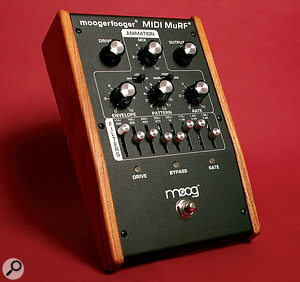 The first Moogerfooger to have MIDI gets an implementation that is both comprehensive and logical. I'll risk accusations of heresy by saying that some operations are even slicker under MIDI control than from the analogue knobs and switches. Certainly, to carry out click‑free switching of patterns during play or to precisely select a desired clock division, MIDI is demonstrably superior. This, incidentally, is the solution to the apparent limit of just 12 patterns per mode. By sending MIDI program changes, you can pick any pattern you like without affecting the filters' Bass or Mids tuning. Similarly, MIDI can toggle the Bass/Mids mode without the hardware switch's enforced pattern swap. MIDI automation is the experimenter's delight, whether used to manipulate each filter's level or to gate individual filters — either by playing MIDI notes or via CCs. Playing the filters from a keyboard is an indulgence that comes highly recommended and is supplemented by Staccato Mode, which changes — entirely as its name suggests — the way note‑triggered envelopes behave. Envelope Scale is a further refinement, acting as a kind of compressor/expander. With it you can vary envelope times independently of the Rate control (otherwise, faster rates will compress the envelopes automatically). There's more. Pattern animation may be stopped, started or restarted at your command, or you can step through the pattern by simply sending the appropriate Continuous Controller. Of even greater practical value is MIDI clock sync. 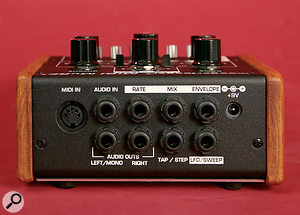 Previously, to sync the MuRF's patterns to your drum machine or sequencer one employed the tap‑tempo input on the rear (or purchased the MuRF Pattern Step Adaptor). Tap tempo is still present — and has its uses — but MIDI sync is more straightforward. The MF105M's patterns can lock to incoming MIDI clock in a healthy list of divisions, from 64th notes to a step every four whole notes. Using CCs, you can dial up an exact clock division and be confident of getting it. This was not something I could guarantee when turning the Rate knob, chunky and lovely and Moogy though it undoubtedly is. Although it was not officially available during the review period, I was given a beta copy of the Pattern Editor to put through its paces. The program's graphics are a friendly representation of the MuRF, and if you take the 'Advanced' option, several functions inaccessible from hardware appear at the tip of your mouse. Here you can set the LFO rate, Envelope Scale and more, either directly from the application or within a VST‑compatible host. It was the separate Pattern Editor window that immediately grabbed my attention — and not only because of its cheery multicoloured filter cells. Each filter's envelope may be triggered (or not) in a loop lasting between one and 64 steps. With an independent loop for every filter, this gives massive potential for creation of intricately layered patterns. To overwrite a factory pattern, simply draw with the mouse, having first decided which location to overwrite. The program sends data continuously and the results are stored in the pedal for immediate audition. Whether you require elementary or mind‑bogglingly devious patterns, the ability to scope them for specific songs is a tremendous step forward. I felt that the original MuRF was an innovative and impressive‑sounding effect pedal constrained a little by the fixed nature of its patterns. In banishing this limitation and adding MIDI control, Moog aim to be the first choice for sequenced filter riffs, whether for stage or studio. There's been no loss of hands‑on simplicity or analogue interfaceability, but the arrival of MIDI clearly gives the best of both worlds. Admittedly, the MIDI MuRF is several degrees more cerebral than its parents, but program up a Logic Environment or your favourite controller, and this needn't cause any headaches. With a pedal of this type, it's the user's job to source the freshest and best input material. Sticking with the same string pad or guitar twang that sounded awesome on day one is a sure‑fire recipe for eventual loss of interest. But employ a little imagination, some MIDI manipulation and thoughtfully‑crafted animation patterns and this MuRF should be gainfully employed for years to come. Either standard or bass operation at the flick of a switch. Offering two MuRFs in one chunky container, the MF105M is considerably more versatile than the models it now eclipses. With the inclusion of MIDI, this Moogerfooger gains additional superhero powers that will animate your chords, grooves and bass lines like never before.